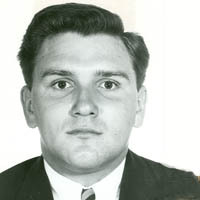 On October 6, 1969, Constable David F. Goldsworthy was found shot in the chest, mouth and neck after a citizen called police who noticed an unattended police cruiser idling for hours. Officers were dispatched to the scene where they found Constable Goldsworthy in an adjoining field. His notebook was found nearby with the name, "Vincenzo" scrawled across one page. Some time later, a catering company employee found the discarded murder weapon in a nearby toilet tank. The gun was traced to the U.S. underworld. It had belonged to a man named Vincenzo.